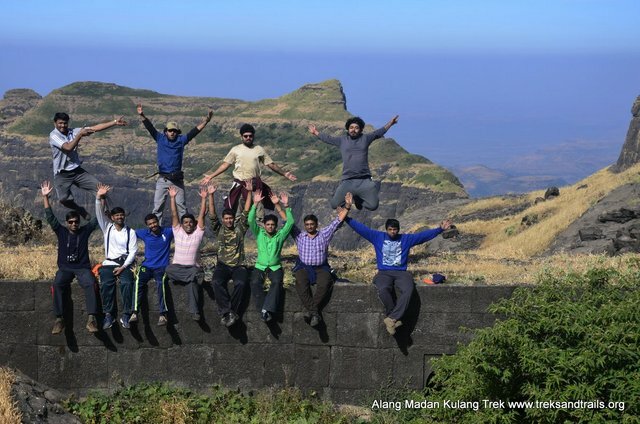 Alang Madan Kulang Trek three days of Junglee Life Long Memories when I started trekking I had visited Ratangad Fort and had seen glimpses of these mountains Three Forts with grade difficult attached to them. Alang Madan Kulang also known as AMK will test you throughout your journey. As usual I did my packing last moment. Things recommended in your Rucksack / Sleeping Mat / Sleeping Bag / Water / Food (Chikki – Soup Sachets – Maggi – Biscuits – Mix Dry Fruit) / Good shoes / Camera / Torch. We boarded the last local Train to Kasara Railway Station try to avoid this last local since Kasara is not a safe Railway Station at night and many robberies have taken place lately our Jeep Driver showed us the cops and many vans patrolling the area. Our Jeep Taxi was waiting for us right outside the station exit. Our train was running late we reached around 1.45 am at Kasara upto 14 people can be accommodated in Jeeps at Kasara. Base Village Ambewadi is one and half drive from Kasara Railway Station. Many shops are open on the highway selling tea and midnight snacks we took a small tea break. We reached Ambewadi Village around 3.30 am. It was cold and windy. Our guide took us to his house we slept in the open, the floor was well maintained using cow dung. We all woke early 6.30 am tea and hot poha awaited us after a quick snack our Trek started. 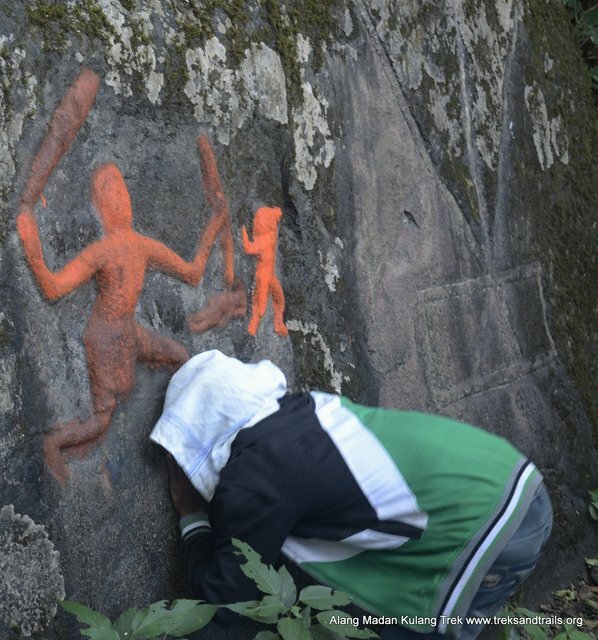 We had hired two villagers our guide Kailash Rock Climbing Expert and Laxman. Laxman was carrying our Food ration for three days on his head and climbing to our amazement. Alang Caves before Alang Rock patch was our destination trek is pleasant till the caves a small water cistern comes on the way where we refilled our bottles. Kailash was carrying coconut and Agarbatti. Into the trek we reached a Hanuman Mandir where he prayed and offered the coconut for our safety and successful journey. I liked how humble he is even though he is one of the best climbers around he is very simple and first to help in any situation on the trek. 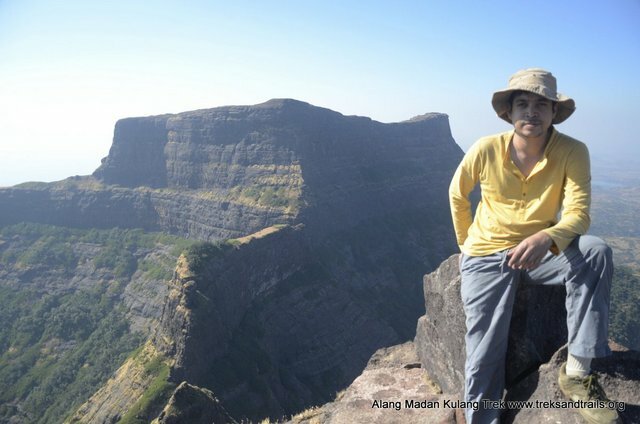 We reached the cave at foot step of Alang Rock Patch we left our bags behind with Laxman. Monkeys are common here take off your belongings. Our First destination was Madan Fort in between Alang and Kulang rock cut steps were visible from distant we carried some lunch and water for Madan Fort. Traverse walk connecting Alang Fort to Madan Fort is simple till you reach Madan Fort we spotted some bee hives and moved quickly to avoid disturbing the bees. To reach Madan you need to cross a traverse there are rock holds to cross you can also use a rope for safety. Madan rock steps are exposed on one side we slowly moved towards the rock patch our guide Kailash climbed it quickly and setup the ropes for us. We all were given harness and instructions most of us were first time rock climbers few people managed to climb the rock patch slowly others who struggled were pulled up at places where they struggled. After completion of rock patch rock cut steps awaited us exposed at one side and windy climate made the climb difficult more rock steps and loose scree patches followed after negotiating them we reached two water tanks at Madan it was lunch time all members came atop we all meet at the cave which was pleasantly cold in the afternoon. AMK Forts have very less vegetation on top and except caves you cannot avoid the sun or wind. We visited the highest point and saw first glimpse of Alang Plateau. After clicking few pics, we indulged in some snacks thepla and puranpoli which were rationed equally by our trek leader. Descend till rock patch was interesting all our sense were heightened loose gravel was making walking along the edge difficult we slowly reached the rock patch Kailash and our trek leader gave us instruction for rappelling which was fun. 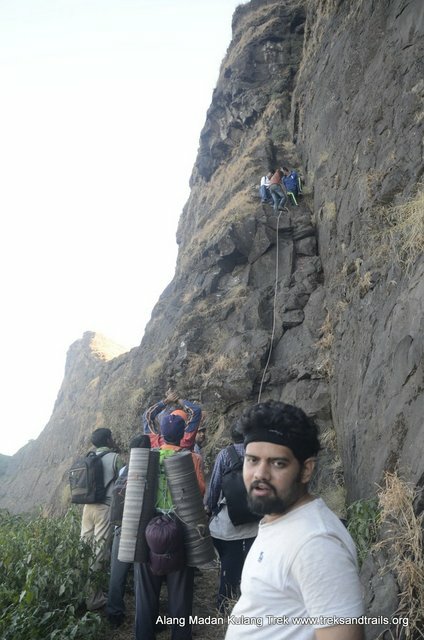 We started walking towards Alang the traverse patch connecting Alang and Madangad awaited us the most difficult at Madangad everyone successfully negotiated it and reached caves quickly. We had a late lunch and started the first 25 feet rock patch towards Alang. It was a simple rock patch though we were tired now and completed it slowly. The main attraction of the trek is the 70 feet rock patch at Alang nearly vertical looked impossible to most of us. Kailash said a small pray and started free climbing with rope it took him less than 5 minutes to climb he performed many splits mid air on rock hold we are were awed by his free climb. All of us were pulled up on difficult patches it was late by now and luckily it was full moon night. Few trekkers were pulled up on second attempt even while you are being pulled up you need to put efforts to climb up using your rope and find holds to put your feet and walk on the wall. It took a lot of effort all trekkers with good muscle power chipped in to pull other trekkers. Once you reach up there is hardly any space for four people a small cave is nearby which can hold 5 to 8 trekkers the steps leading to Alang Plateau is very small you need to mind your rucksack it can easily push you into exposed fall. It was late evening our group leader asked us to adjust our bags and sleeping mats it was very windy we moved very slowly after few steps we found hold on steps. It helped us gain confidence to complete this patch safely we finished this section cautiously. We were all excited to have finished the Alang climb safely our guide Laxman had moved ahead in the cave our simple dinner was getting ready. It was bitter cold and windy outside and warm inside the cave many water tanks are present at Alang with water available till summer. We had an early dinner and slept early the long day finally took its toll. Another group was present in the cave we found chicken feathers in the water tank near the cave and the water tank was very filthy many people use forts for chicken bbq and alcohol party which is bad. Our Trek leader woke us up early for tea and breakfast. We visited the ruins atop the fort a small Wada is present which is slowly eroding. There are many water Tanks here bigger than below the cave and water is much better for consumption from here. You can see Kalsubai and Ratangad fort from here. 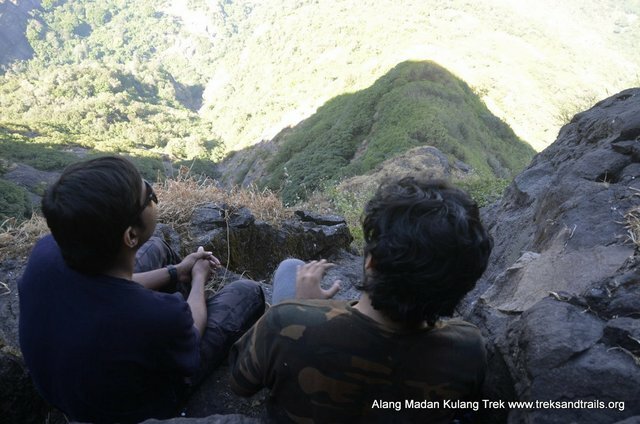 We ate early lunch at Alang around 10 am and headed for Kulang fort to complete our trio trek AMK. We were briefed about our long walk till Kulang Fort by our trek leader. This is a long walk you need to cross all three fort to reach till the steps at Kulang Fort. 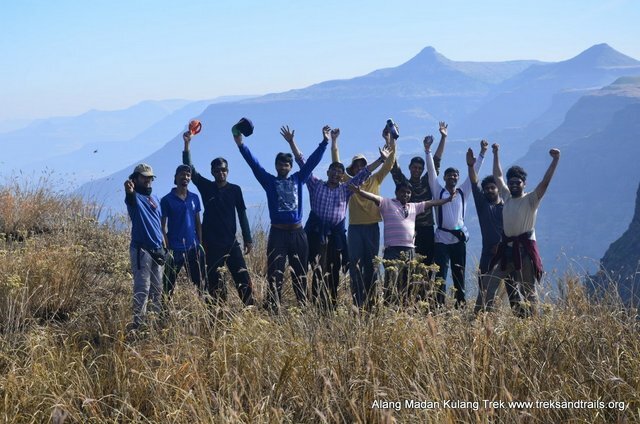 First we completed Alang Fort Traverse walk which was quick and reached Madan Fort col. Then we started walking behind Madan Fort in sun light first time we were exposed to Sun during the trek most of the time sun was behind us. Traverse walk till you reach Kulang Fort is difficult warm rocks, loose gravel walks, highly exposed patch at some places there was hardly place for one shoe sometime. There is no water tank during this section water is directly available atop Kulang fort. Col between Madan Fort and Kulang Fort there is small descent which is mostly loose soil a rope was used to support our descent. Kulang Fort Traverse although easy is heavily forested we got slapped by leaves constantly. We reached the rock steps by 4 pm after a long walk. 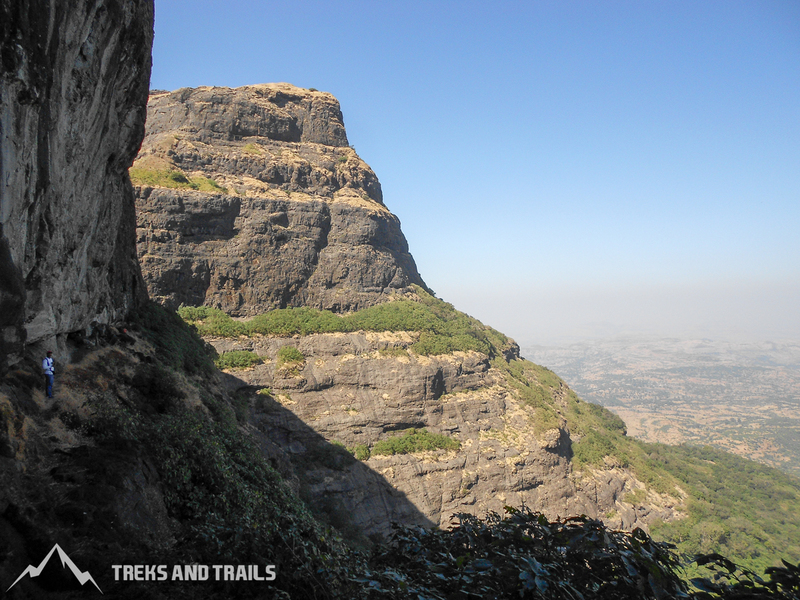 Rock steps are steep some exposed some too small for 10 size shoe we finally reached at Kulang fort by 4.30 pm. To our surprise small kids were bathing in some of the water tank a local family had come nearly 20 to 30 villagers all ages, kid’s teenager’s uncle’s aunties. Cave was full it is a very small cave 20 people max another group of villager’s local boys carrying wood log came 30 minutes after us. They got too much wood for bonfire. Since the cave was full of Ladies we decided to camp in open near one of the water tank our dinner was getting ready soups maggi dal and soya beans sabzi. Water is polluted atop Kulang Fort again some people had put chicken feathers in some of the tanks many people washed them self directly at the water tank. A larger water tank is present towards Madan Fort side which has drinkable water and can be used as camp site. 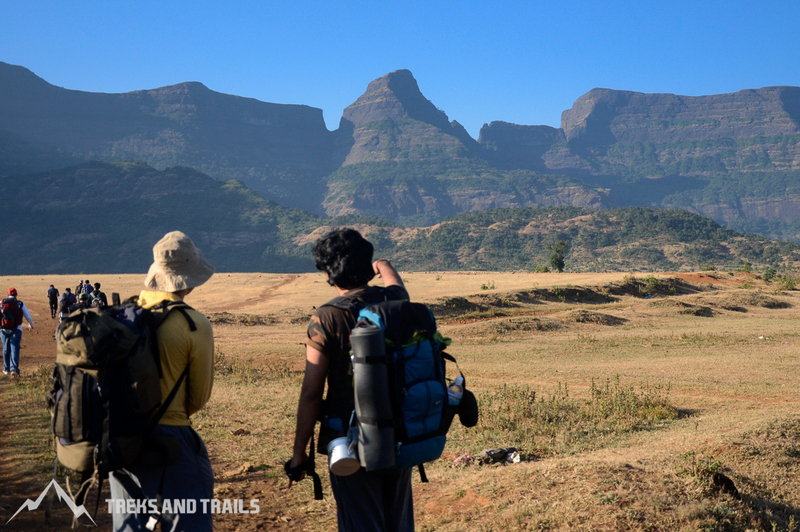 We had tea and biscuits and found our spots to watch the Sunset Kulang offers the best view Kalsubai Ratangad and on a clear day you can see Harishchandragad according to some locals. It was cold and windy again were wore all clothes we were carrying three layers. Nobody slept early dinner was tasty and we all were sharing our experience with steps and rock climbing and rappelling we all did some night photography moon light was very strong it was like late evening all night atop Kulang Fort. Locals had got fire crackers and gave us a good fire show. Other group had brought Dhol and some musical equipment and was partying all night. 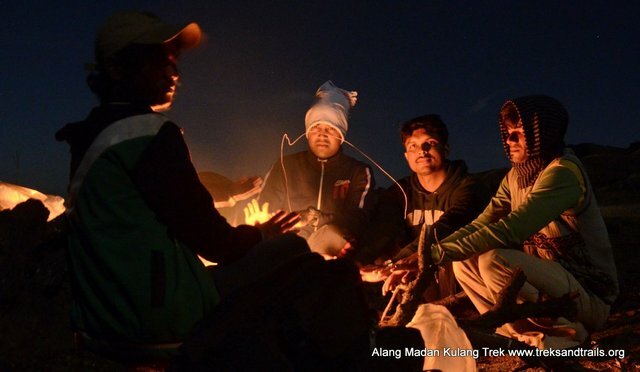 Most of us hardly slept cold and wind kept us awake all night some trekkers made some Maggi and tea at 4 am. They tried waking us all but only few woke up. 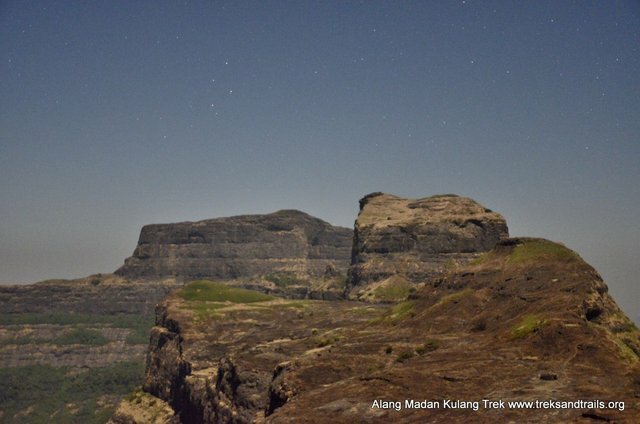 Early morning sunrise is amazing atop Kulang Fort you can watch sun rising near Kalsubai. It gets hot quickly all residents started leaving Kulang Fort early. Descent of Kulang Fort is challenging you need to be careful all the time steps are small at some places. Kulang Fort to Ambewadi Village descend is long though comfortable and water was available in the jungle we made lunch and recovered some energy for our final push till Ambewadi village. We reached the village by 3 pm completely exhausted with some Junglee Madness. 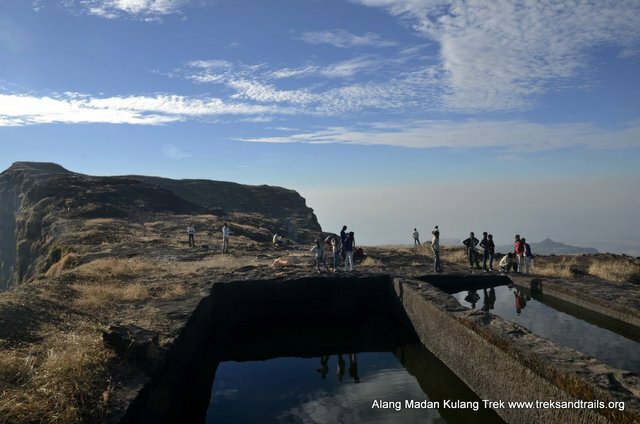 Alang Madan Kulang Trek is once in a lifetime trek you should take your time here enjoy each and every step you will never be so close to fear height / thrills / cheating death / achieving the impossible. Me nd my 7 frnd want to do AMK track. Do u hv any plan in this jan Feb??? Nice read. Would you recommend AMK in monsoon? Also can you please share details of local guides, equipment to carry, food and potable water source.